Bring democracy to our education! SDS is happy to state that after a very brief pressure campaign on the All-Campus Elections Committee and Student Unions & Activities we will be allowed to get the remaining 35 signatures by the end of the day Tues, March 27. We know that students want to be able to vote on tuition and fees issues and want to vote on administrative bloat at the University. This victory is just the first as we go next week into all campus elections on April 2nd. 1. I agree that there should be no tuition increases and no fee increases without student consent. I agree that any tuition and student fees increases require a vote of the student body requiring a majority (50%) of the student body to vote, and of that majority, that any increases be passed by a margin of 70% or more in favor. 2. I agree that any administrators making over $200,000 take a 5% pay cut, those making over $300,000 take a 10% pay cut and those making over $400,000 take a 15% pay cut. 3. I agree that there must be a 10% cutback in the number of administrators at the university in 2012. In addition I agree that all future cutbacks must be equally applied to administration as to all staff and faculty of the university. These points are meant to make the University a fairer place. Demanding students have the right to vote over tuition and fees increases would bring a new level of transparency and democracy to our education. We would no longer be billed for stadiums many of us will never go to, or see our tuition rates rise while class sizes increase and class offerings shrink. Additionally, the only staffing unit that has not been reduced by 10% is administration. This is also the only group that has seen widespread wage increases on top of salaries and benefit packages that are more than most staff will see in their entire careers. We know that state support for the University has been dwindling. However, only some have had to make sacrifices. Students have seen their tuition rates go up; and staff have seen wage freezes and increased costs for benefits in addition to layoffs. That burden should be shared by all, not disproportionately effect those with the least. April 2nd, 8am through April 4th at 8am the all-campus elections will be open for voting. You can check the email in your inbox or go to Onestop for a link to the electronic voting site. Let’s send a clear message to the University administration that we want a fairer university with more say over where our tuition and fees dollars are going! And help spread the word! Talk to your classmates and friends about voting for these referendums. Stop silencing Student Voices and Bring Democracy to the U! These points are meant to make the University a fairer place. The only staff that has not been reduced by 10% is administration. This is also the only group that has seen widespread wage increases on top of salaries and benefit packages that are more than most staff will see in their entire careers. Moreover, demanding students have the right to vote over tuition and fees increases would bring a new level of transparency and democracy to our education. We would no longer be billed for stadiums many of us will never go to, or see our tuition rates rise while class sizes rise and class offerings shrink. However, the All-Campus Elections Committee (ACEC) is for the second time, denying our referendum see the light of day. First it was to change the wording and now they say they cannot verify the student status of all the signers. It has been at least 8 years since a referendum has been on the elections, and student participation in the elections is appallingly low. And now instead of putting the points above on the ballot they are silencing the voices of the nearly 1,000 students who signed the referendum to be able vote on these points. Call the Student Unions & Activities office and/or email Brock from the All-Campus Elections Committee and demand that they waive the minor number of signatures that are missing or allow SDS to have 1 day do get the remaining signatures! March 20, 2012 Students for a Democratic Society at the University of Minnesota submitted over 450 signatures to the all campus elections board calling for cuts to administrative salaries, reduction in the number of administrators, and student voting on any tuition and fee increases. From here these three demands will go to the all campus elections on April 2nd. “For the first time in recent memory students will have a referendum on the all campus elections, but it’s even more significant that this referendum calls on administrators, who are living large on our bloated tuition and fees, to take pay cuts and reduce their ranks,” said Rachel Hauser, SDS member and freshman at the U. Demands for cuts to administrative costs and for more student say over education costs are a commonly felt sentiment amongst students. SDS members believe that the 3 points of the referendum will pass the all campus elections. “We were able to collect the required signatures in less than two days time with many students emphatically agreeing to sign. It’s time for students to speak up, and this years all campus elections will hopefully show the larger mandate of students against outrageous salaries for administrators and against fee and tuition increases that are unjustified,” continued Rachel Hauser. Downloadable PDF To Use on Your Campuses Here!. Petition for UMN Students: We DEMAND the University allow our referendum go to vote! Email us at umnsds@gmail.com or join our facebook group (link below) to stay up to date on the freshest in-the-know on the All Campus Elections. By signing below I agree that these three points should each be individually brought to a referendum in the all campus elections of April of 2012 at the University of Minnesota. Tallahassee, FL – On Thursday, March 1, the student movement in the United States took a collective step forward in the fight for higher education. 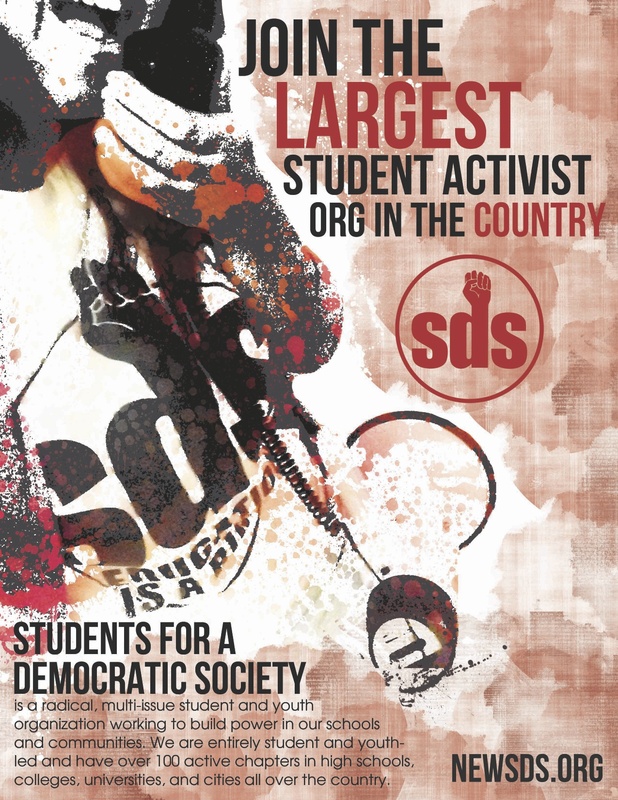 Students for a Democratic Society (SDS), along with Occupy Education groups across the country and other progressive student organizations, held a nationwide day of action against crippling budget cuts, tuition hikes, and student debt. In Chicago, Illinois, more than 100 students marched and rallied downtown at the Chase Bank Tower. A few students organized a short political theatre sketch, in which mock-representatives of Chase handed out fake diplomas in exchange for immense student debt. Afterwards, the students marched to DePaul University’s campus and held a sit-in to demand a meeting with President Rev. Dennis H. Holtschneider about rising tuition costs. The group of students read a speech directly outside of Governor Scott’s door and proceeded to stage a sit-in on the fourth floor of the Capitol. Some parents who happened to be visiting the legislature that day then joined the students! Further south in Gainesville, Florida, around 20 students from the University of Florida rallied outside of Tigert Hall, the Administration Building, to protest the University’s retention of Florida Senate President Mike Haridopolos as a professor making $75,000 annually. While taking a big paycheck from the University, Haridopolis has led the charge to slash higher education in Florida. The University of Florida students hung an enormous banner across both doors of Tigert Hall reading “Worst Professor Ever” in reference to Haridopolis. They then proceeded to fill out negative student evaluation forms, which denounced Haridopolis’ attacks on students, workers, and undocumented families. In Tampa Bay, SDS at the University of South Florida organized a walkout and a rally at the Marshall Student Center. Almost 200 students attended, and after several students gave militant speeches outside, the students forcibly occupied the Student Center and staged a sit-in, demanding an end to tuition hikes and budget cuts.